Children unfortunate enough to be born in the month of December often grumble how unfair it is: they get one present instead of two – and even if it’s a bigger one it’s no fun when you’re four! – and the day that should be special for them is somehow lost in all the Christmas preparations. Even with the best will in the world it can be difficult to make the day stand out from what will inevitably be a busy and exciting season with school concerts, parties and pantomimes. The answer is to make the day as unlike all the others as possible and to do that you need to choose a theme that has absolutely nothing to do with Santa, elves or reindeer. If you’re lucky enough to have snow on the day that would be a bonus but snow isn’t something we can rely on December in Britain so we have to make alternative plans. And the opposite of a dreary day in December is a sunny day in summer, so why not think about a beach party? If you live near the seaside you could take this a step further and plan a wintry picnic but, as British weather is so unhelpful, bringing the beach indoors may be the wiser choice. If you’re able to decorate the party venue so much the better. Brightly coloured bunting, deckchairs, buckets and spades and a big cardboard sun hanging from the ceiling will all help to set the scene. It’s even possible to buy inflatable palm trees. If your child is a pirate fan that makes the scene setting even easier. What about a sand castle? Or a desert island? Both are easy to create and the decoration can be as simple or complex as your time and ability allow. Make 4 layers of sponge cake. Sandwich together with jam or butter cream and trim into a dome-shape, leaving the top flat. You don’t have to be too accurate or neat. Keep the off-cuts to make little turrets for the top. Make up some butter cream and colour most of it very pale orange. Retain some uncoloured for later use. Spread over the cake, including the turrets, to cover. Sprinkle a fine layer of brown sugar over to create the ‘sand’ effect. Stick a paper flag (available from beach shops!) in the top. Colour the remaining butter cream pale blue and swirl around the base of the castle. Sprinkle with some desiccated coconut to create a watery wave effect.If you have time, make a crab, shellfish or seaweed from ready-made roll-out icing and use to decorate the castle. Make a large rectangular cake – a cake about the size of a roasting tin will take 4 eggs, 4 oz self-raising flour, 4 oz caster sugar, 4 oz margarine and 2 teaspoons baking powder. When cool spread a thin layer of jam all over. Roll out ready-made icing and trim to cover completely. Using a small paintbrush and colouring paste paint an island on the top of the cake. Allow to dry before painting the blue sea around the edge. Damp the island and sprinkle with brown sugar for a sand effect and desiccated coconut for the tide line. Use shop-bought cake decorations e.g. palm trees, small boat, castaways, a shark, to decorate your island and sea. Alternatively use Lego characters from the pirate collection. You can use moulding paste to make your own tree, castaways, and wonderful and amazing sea creatures if you’re of an artistic nature. Or even a shark complete with teeth dripping with blood! 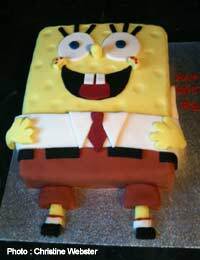 Spongebob is a popular character from children’s television; it’s possible to make simple shapes from roll-out icing or use the stiffer moulding paste that dries hard. Colour it using food colouring in paste form. Create a simple underwater background in which to place Bob and his fishy friends. Butter cream is easy to colour and pipe if you want a more decorative effect. The little mermaid is popular with young girls. Again a simple underwater scene with fishes and sea weed is easy to make while you can create a mermaid from roll-out icing. Or a green field with Timmy Sheep and his friend Yabba the duck is instantly summery. Winnie the Pooh and friends have plenty of summery adventures especially with bees and balloons. Find an image in a book or on the internet, trace it and transfer the outline to roll-out icing. Used piped butter cream for decoration. The ideas we’ve offered are very simple but you can take these basic ideas and build on them. Think about what your child loves to read about or watch on television. By using distinctive colours a simplified version of a character is still identifiable. But whatever you decide to design, go for bright sunny colours avoiding the Christmas reds and greens together to ensure that your December child’s birthday cake is the most memorable yet.